After her husband dies, a hot young mom, her equally attractive 16-year-old daughter and 9-year-old little sister pack up and head deep into the Pennsylvania mountains where they’ve inherited the family house. It’s more like a rat shack, though, with none of the amenities hot chicks need, like a slow-motion shower. The littlest sibling hears children’s voices in the dark woods surrounding their four-story Roach Motel™ and wanders off. She discovers a mine shaft opening. This was the site of a tragic tragedy 90 years earlier in which 15 kids died while working in the coal mines. These minors were miners. Heh. Those same kids, now ghosts, come back every night for redemption and food. Not necessarily in that order. 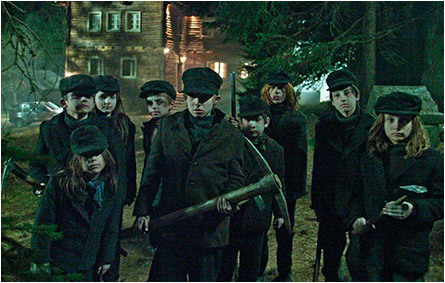 They have black eyes, zombie faces, and carry axes and picks and shovels. And not one of them had a Nintendo DS™. A local crazy guy who lives in an equally lavish dump nearby, drains his own blood into jars and goes around painting doors to keep the zombie kid ghosts out. Meanwhile, the youngest daughter has befriended one of the ghosts and are now BGFF. The mom discovers old photo albums and newspaper clippings in the spider web-y basement and starts to piece together the disaster that happened all those happy years ago and finds out she’s a descendant. Another descendant: the arrogant land owner who’s getting ready to evict everyone so he can turn the mountain into a ski resort (ghosts get half-off ski lift tickets). The local crazy guy ties up one of his pigs outside the land owner’s house, and the zombie kids play whack-a-mole with it. Then they eat it as though it were wet beef jerky. No flinching on gore, violence or swear words. 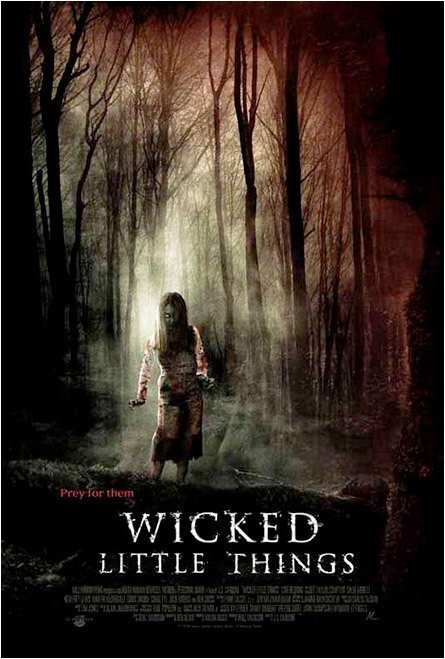 Rent a pig and watch Wicked Little Things (2006) — you’ll both walk away having learned a few life lessons. This entry was posted on September 14, 2018 at 3:26 pm and is filed under Evil, Ghosts, Misc. Horror, TV Vixens, Zombies with tags Evil, Ghosts, Misc. Horror, Nintendo DS, Pennsylvania, Roach Motel, TV Vixens, Wicked Little Things, Zombies. You can follow any responses to this entry through the RSS 2.0 feed. You can skip to the end and leave a response. Pinging is currently not allowed.